23rd December: The last post this year, wishing you all a very Merry Christmas! 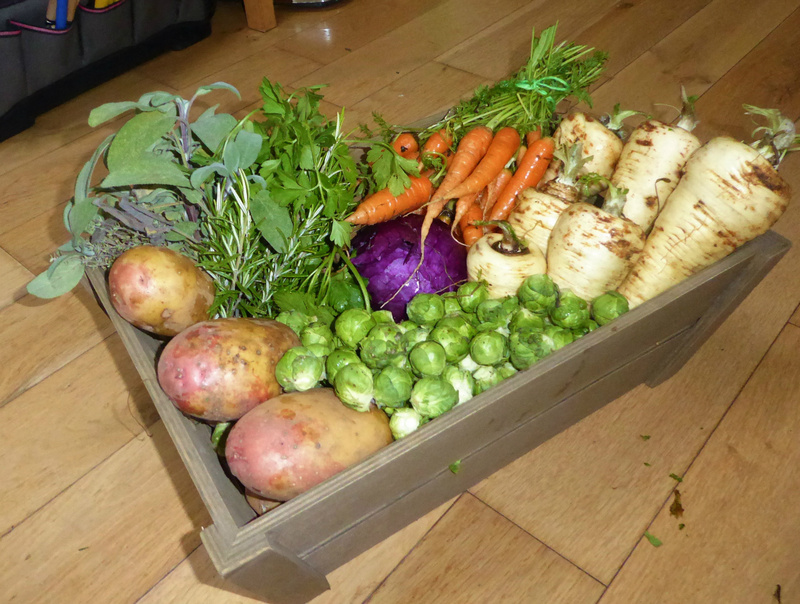 Harvests a-plenty this week, for our Christmas dinner : parsnips, carrots, sprouts, red cabbage, and potatoes from the store, together with Flat Leaf Parsley, Sage, Rosemary & Thyme, just as in the song! I am especially pleased with the carrots, which were sown in July, a small pinch at a time, each pinch about 10cm apart, with no thinning. They can now be pulled by the bunch, and as you can see, look good! I shall be doing this again next season as it is low maintenance and very productive. 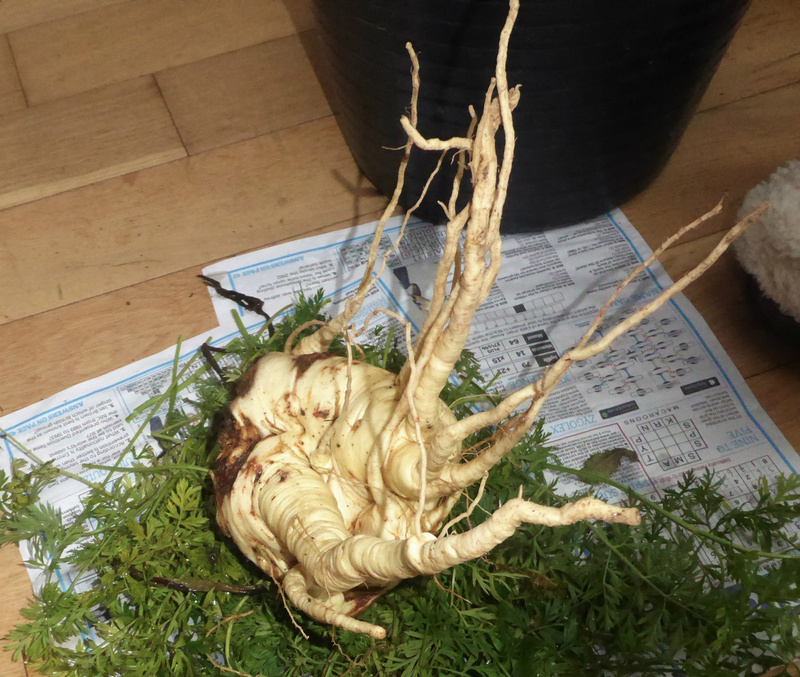 There was one mutant parsnip that appeared , the fattest, ugliest beast we have every grown! 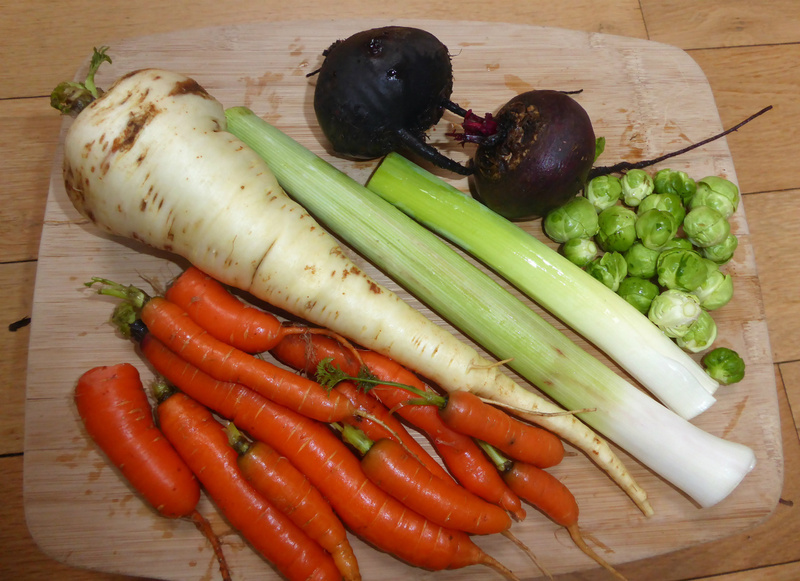 Mind you, it will be added to the trivet of vegetables under the meat, giving an extra flavoursome gravy. 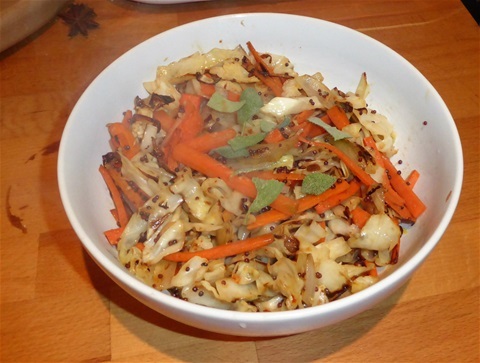 The cabbage is from a small sowing of Red Flare back in May, and will be cooked with apple and onion as a side dish. I learned my lesson the hard way, not to sow too many seeds of vegetables we don't eat that many of. 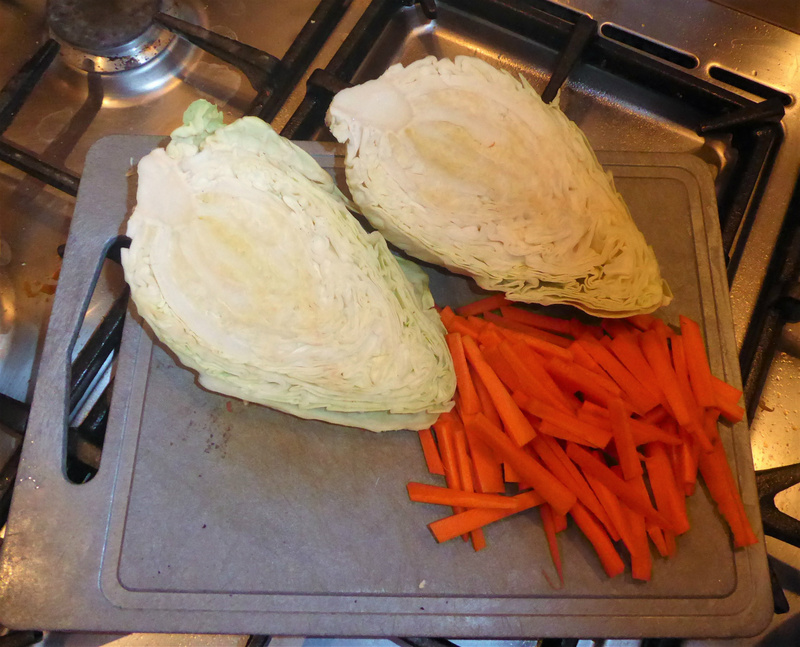 Pickled cabbage did not go down well and so this year we have only grown about six, which is plenty for us. The parsley is the new growth after a heavy cutting six weeks back: the very mild weather, coupled with the protection of the enviromesh, seems to be suiting it well. The weather is still unseasonably mild, and the weeds are loving it. The persistent fog has led to the soil being very wet and claggy, espcially on #146, where it has not yet benefitted from any added oragnic matter in the onion bed. This makes weeding very tricky as the fingers of my gloves clag up wth mud and grabbing the weeds firmly is awkward. Hoeing is impractical as the uprooted weeds then just start growing again as soon as my back is turned, so removing them is best... if only I could!! I did manage a couple of metres of the bed though. Onions hate sharing their space with other plants, so it'll be worth the effort for their comfort. Only a metre and a half to go, and then the onion and garlic beds on #145. The other seasonal job, which I really enjoy, is dressing the jars of preserves to be added to the Christmas Hamper gifts. I love going through the shelves outside in the garage, choosing what I think people will enjoy. Usually the jars need a decent label too, as I often only use temporary ones for storage. After the year we had snails in the garage that ate long thin scrapey holes in the labels, it seems wise to keep the pretty ones until the jars are going to be gifted. I had run out of fabric, and fortunately found something suitable locally, so avoided a trek into town, which is always so crowded at the time of year Tied with bright lime green or red string, they really looked very festive. 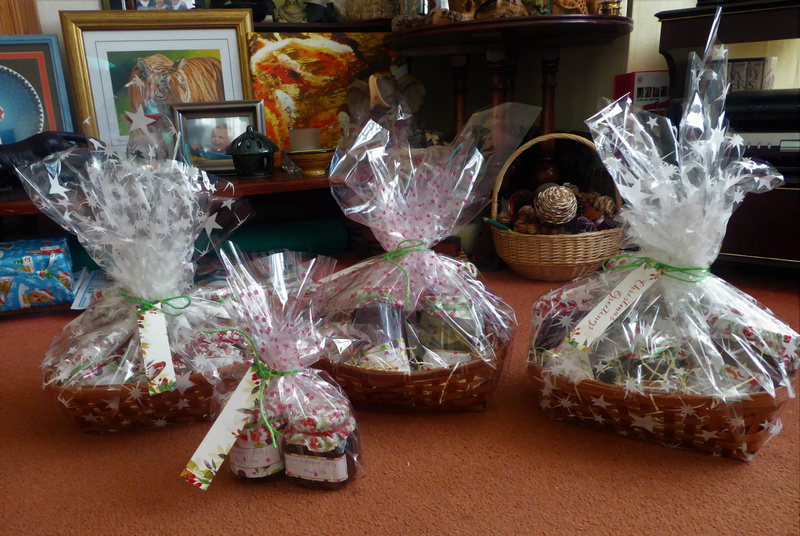 So here are some, in their smart cellophane wrappers awaiting the morning. This is why we Grow our Own!! 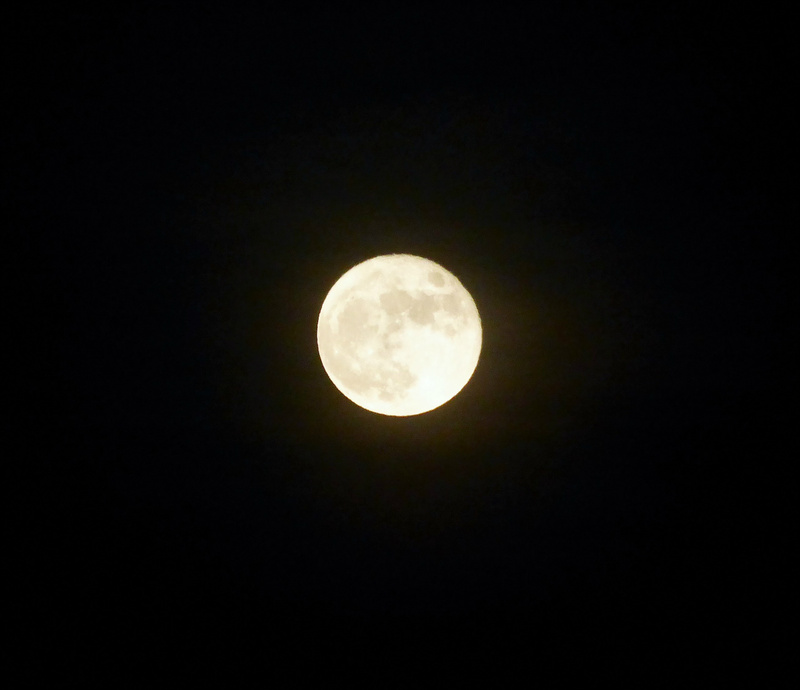 19th December - Last Wednesday saw the last full moon of the year, and absolutely glorious it was too! 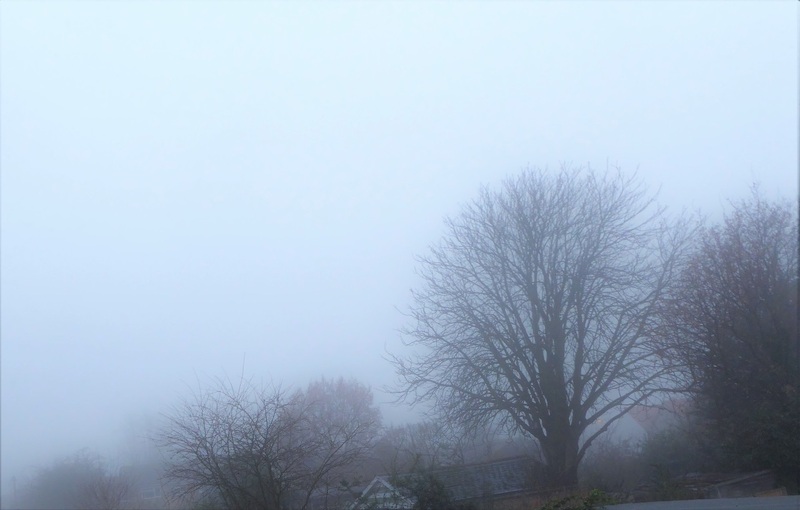 However, that was the last time we were able to see the sky, as there has been fog since then, day and night and everything has been dripping with water, making it difficult to do much outside without also slowly getting soaked. 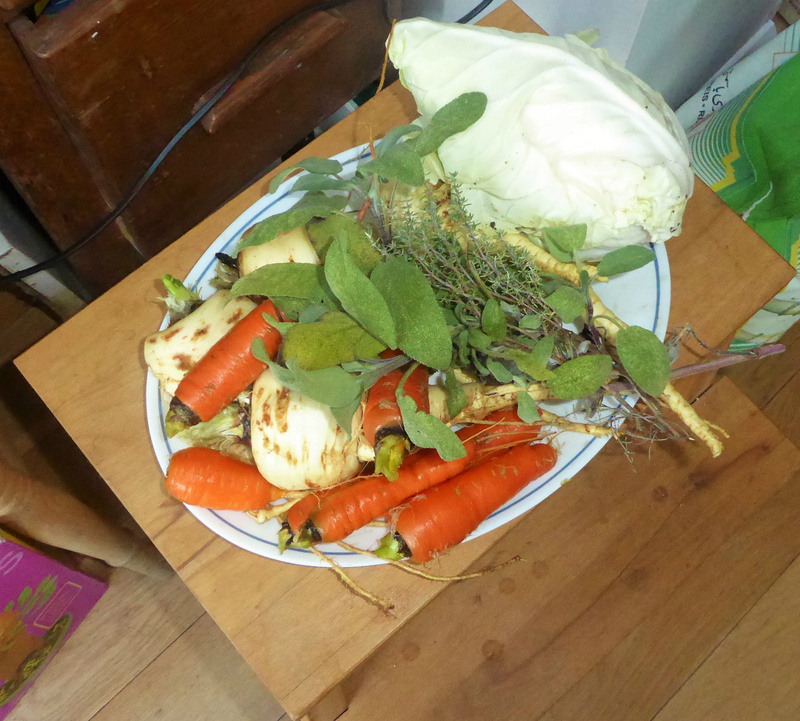 Despite the weather conditions, we have still managed to harvest some vegetables. It is around this time in the year that planning ahead for crops to harvest in the Winter starts to pay off, so here, to celebrate Harvest Monday again this week, is what we have gathered, all for the meal shown as this week's header! Parsnip: Last week you saw some of the ugly roots, but parsnips being a traditional vegetable with Christmas Dinner, I wanted to check what else was buried in the ground. It can be a bit difficult to dig the larger roots out undamaged, so I partly unearthed this one by hand, poured water in around the root, left it for half an hour and then slowly manoevred it out. Not perfect, but certainly good enough when peeled, and truly delicious when roasted. 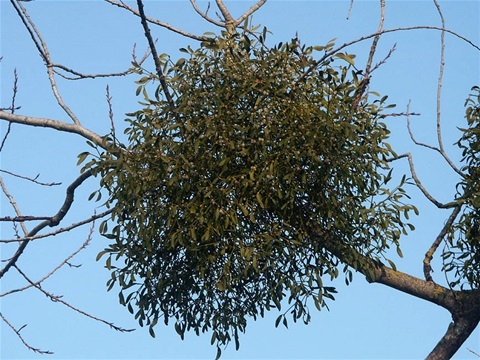 The plants are protected from pigeons by a net, and once the yellowing leaves were removed, the full stems of buttons were revealed. 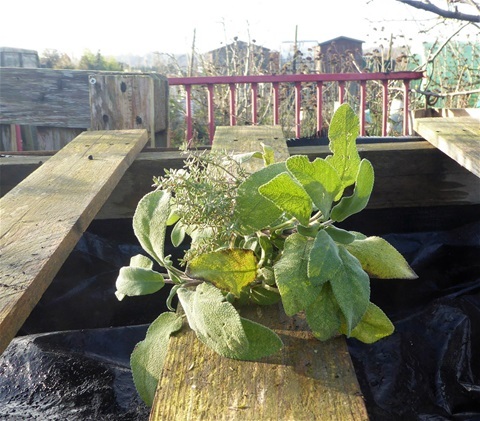 It makes sense to plant the Purple Sprouting Broccoli and Savoy cabbages in the same bed, as then the net can be supported right acrosss them all. Leeks seem to be growing strongly, but one of those harvested had the tell tale orangey streaks along the white stem, which when cut open, showed the tiny brownish pupae of Leek Moths. 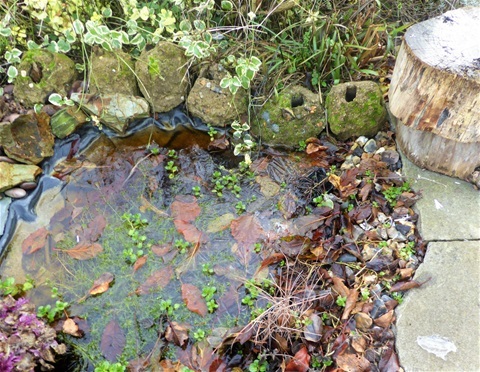 These were a real problem earlier in the year, with caterpillars eating the green leaves. I picked off as many affected leaves as I could, but clearly not all of them, as some grubs managed to find their way down into the centre of the plants. I hope there are enough undamaged plants for us to eat through until Spring. Next year I shall grow our leeks under enviromesh to keep these pests off. 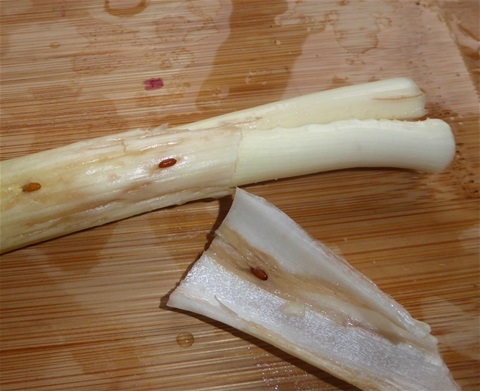 This might also reduce infection by Leek Rust, which while it does not make the crop inedible, is very unsightly. We have also continued to have lettuces, pak choi,flat leaved parsley and spinach from the plot and fresh chillies from the greenhouse at home. One edible I rather like the sound of is Yacon. This is a fat tuber, originating from South America, that mulitplies away under the ground in a similar fashion to dahlias, to give cripy, juicy edible tubers which can also be used to make a syrup. They do grow deep however, so I aim to grow them in large plastic builders' buckets, one per bucket, so that I can just tip them out around next November. At least that's the plan! The rather titchy little tubers have been planted into 5 ins pots to overwinter in our greenhouse at home. These little shoots are different to the edible tubers, forming just around the base of the stems. I don't know much more about them really, and am following the instructions from Real Seeds, where I bought them, as well as advice from Beryl of Mud and Gluts. 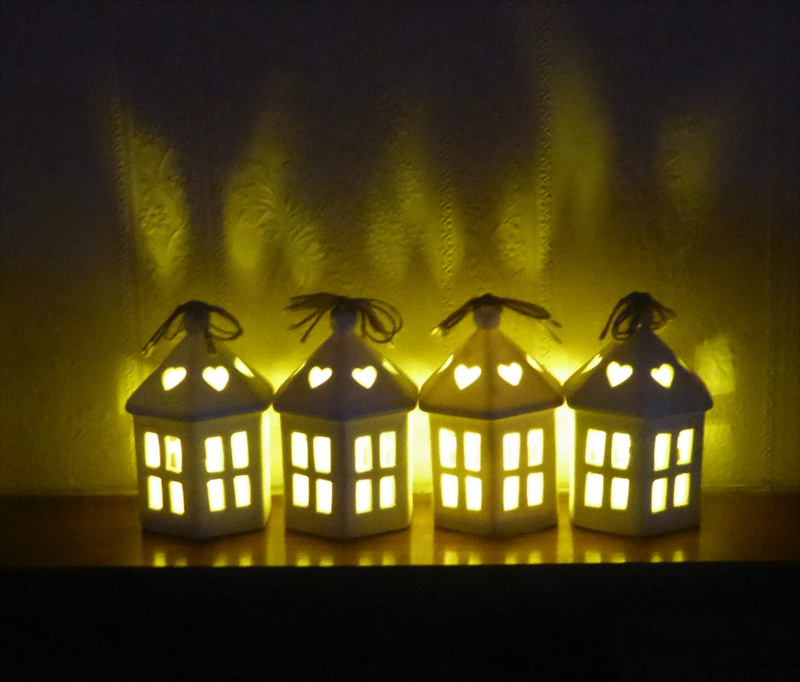 It seems hard to believe it is less than a week until Christmas, doesn't it? 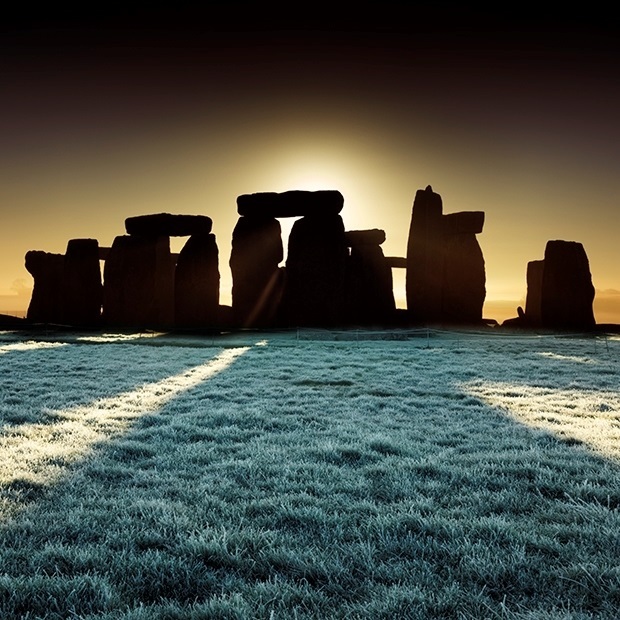 Where the growing year is concerned, next Wednesday is a key date however: The Winter Solstice, when we have the shortest day and the longest night in this hemisphere. It was the traditional "First Day of Winter" long before meteorologists deemed it 1st December. It is a time to reflect on what we have learned this year, and plan how to build on this in the next. 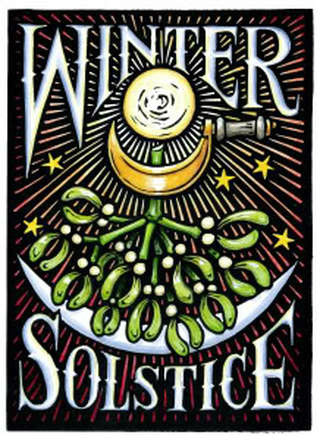 So, to end my blog this week, Winter Solstice goodwishes to you all, and Merry Christmas for next weekend. Our crops are not always pretty but they taste good! 12th December - Review and planning time now!! The weather may be unseasonably warm, but it is time to review what went well, what is worth growing again and what not, as well as look around for anything new to join the throng. I have tried to be sensible in sticking to what we have space for in the beds, rather than what I have space for in the seed tins, but extras do have a habit of creeping in, as any seedaholic knows. There is also the not-inconsiderable matter of how to fit all the seedlings and young plants into the greenhouse before they move to their final planting spots ..... a huge feat of ever shifting trays and pots that somehow gets more complicated every Spring. Plenty of crops still arriving on our plates for thsi season's plants though, so here goes with this week's Harvest Monday!! 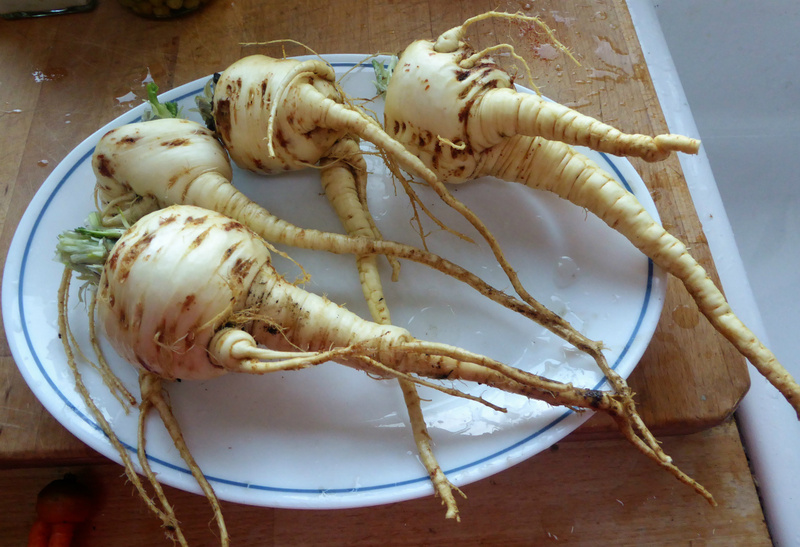 I took up some more of the parsnips, choosing those were fairly easy to wiggle out of the ground, as these are usually mis-shapen ones, so that the "best" ones will be available for Christmas lunch in two weeks' time. 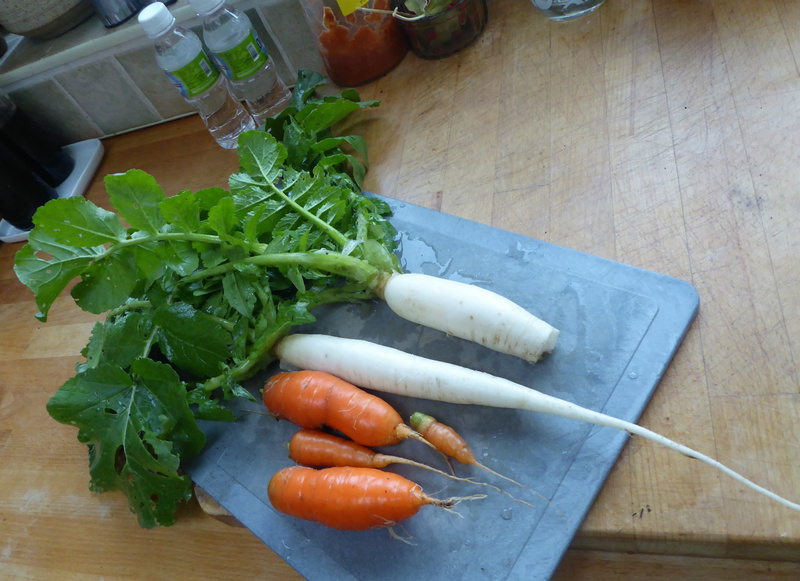 Once trimmed up, these will make a good soup to have for lunch with home made rolls. They do have some canker damage, bit it is only skin deep so will easily be removed when they are peeled. And here it is. Two shallots, some garlic, ginger and black mustard seeds, cooked until the shredded cabbage begins to brown, topped with some shredded sage leaves, and there you are. We ate it with some boulangerie potatoes with a piece of rump steak over the top of it in the oven for the last 10 minutes, but it would make a good addition to an indian-style meal too, especially if the sage was replaced by coriander leaves. Added to the harvest this week were Sage and Thyme. They both grow prolifically on our plots. In fact the Sage is so prolific we shall be cutting it back hard in the Spring as it blocks the paths. In dry weather it is very pleasant, brushing against your legs and releasing its distinctive scent, but in wet weather you just get soaked. In case the hard haircut kills it off, I have grown a couple more plants from cuttings, and planted them in with the Rosemary hedge as a back up. 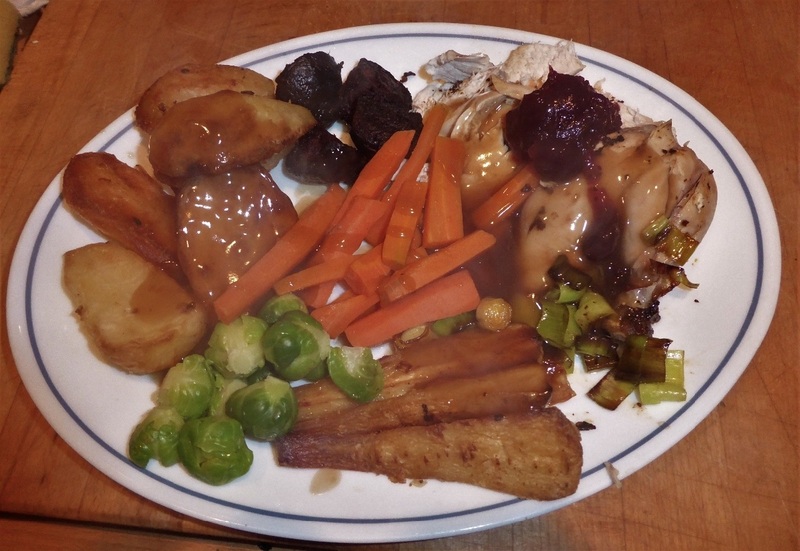 I love being able to cut swathes of it come Christmas, to add to the traditonal stuffing. 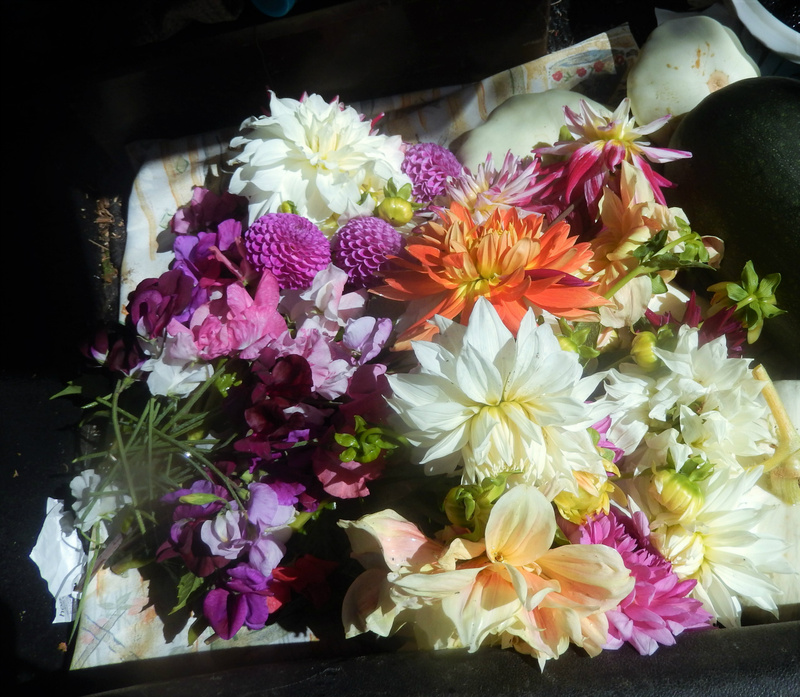 And that is the end of our harvest this week, although the dahlia tubers we dug up looked pretty good and I have been told they are edible. However, they are sitting upside down in one of the sheds to dry off and wait out the Winter, until it is time to plant them again. Surprisingly, the ground was not too wet, so digging them up was not the feat of strength it has had to be in the past. For the first time this year we are leaving some in to overwinter and will mulch them well with manure and compost to keep out any frost. 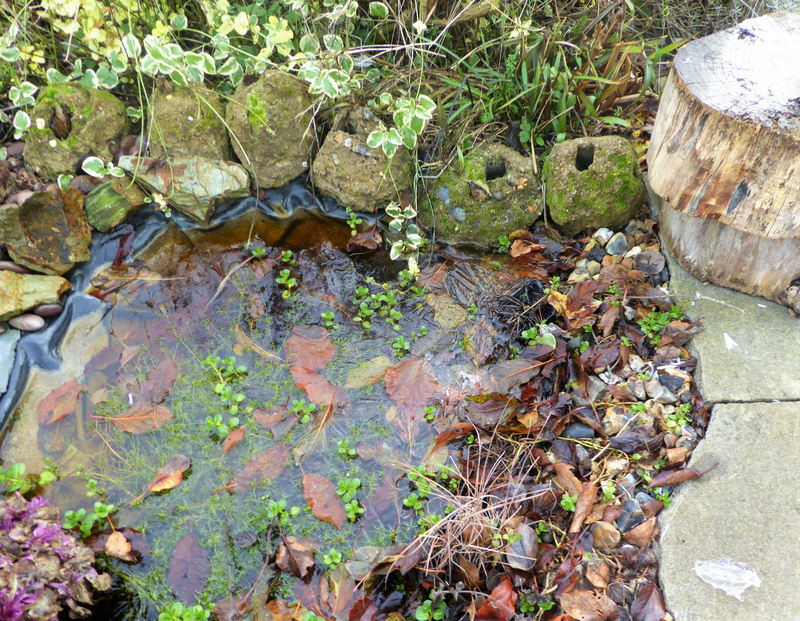 If the ground starts to get water logged they could rot, so fingers crossed for a dryish winter. We took up the ones that will be in the way of vegetables next year, and the purple pompom one that I plan to divide in the Spring. They included the new maroon ones and the Bishop of Llandaff that I bought at Wisley last April. It was good to see how much the tiny tubers had increased in bulk, which bodes well for a good display next year. 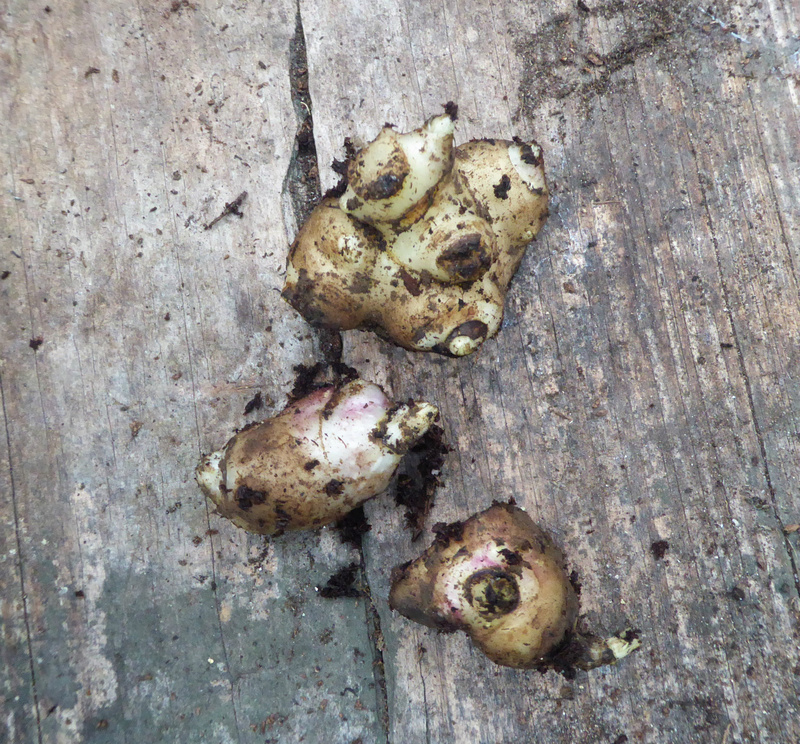 I also cleaned off the begonia tubers that were brought inside before we went on holiday. I checked each one thoroughly to make sure there were no vine weevil grubs settled in for a siesta ... I found six, so glad I had bothered. They can totally destroy tubers in storage and then when the adults hatch out and lay eggs, roots of other plants get eaten too. Definitely worth the time to winkle them out! And next year I shall try to stick to a smaller number of varieties, to give decent sauces, a decent chutney, a range of salad types and at least one large fruited one for stuffing. If we have the polytunnel up in time then most of the plants will be grown under cover, but with everything else on that to do list, I am not sure if there will have been time by then, so I shall be in the odd position of having to decide what to grow before I know where it will be growing! Usually to end, I have a photograph of flowers, but the wet weather has reduced most of what is around to brown soggy balls, so to ring the changes, here are the rolls made earlier this week. This is the first time I have used a ciabatta bread mix, and I was most impressed. 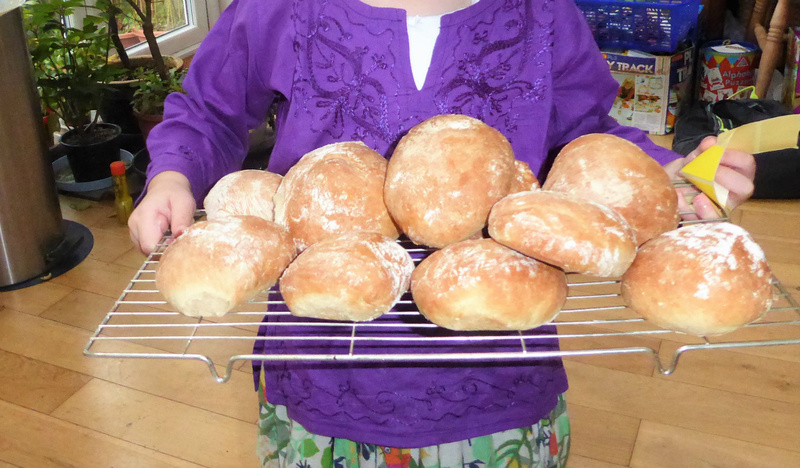 The plan had been to make some rolls with our youngest granddaughter, who is nearly four, only to find that I didn't have enough bread flour (Luckily before the yeast had been set to froth). I did have the packet of mix though, that I had bought for emergency use a few weeks back, so out it came. After the dough got a bit too stiif for young fingers, Rowan had her own dough to knead, while I dealt with the rest... and here are the rolls. They had a soft crust and a really good texture, as well as a decent flavour, and Rowan's roll was edible too. They certainly didn't last long! That is all for this week. I hope you enjoyed sharing the photos of our harvest and some of what we have cooked with them too. 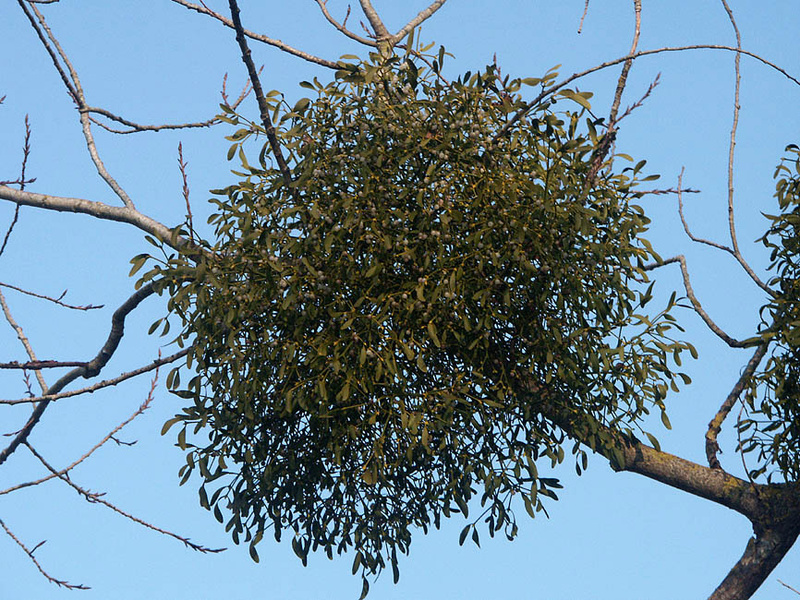 As we had thought, the leaves had mainly fallen by the time we returned: on the way home I noticed that the bright green globes of mistletoe seem to be on the increase. This is a plant steeped in folklore, growing its rootlike structures into the bark of a host tree, taking water and nutrients for itself. For me, the sudden magical reveal of all the green spheres in the trees marks the beginning of Winter. 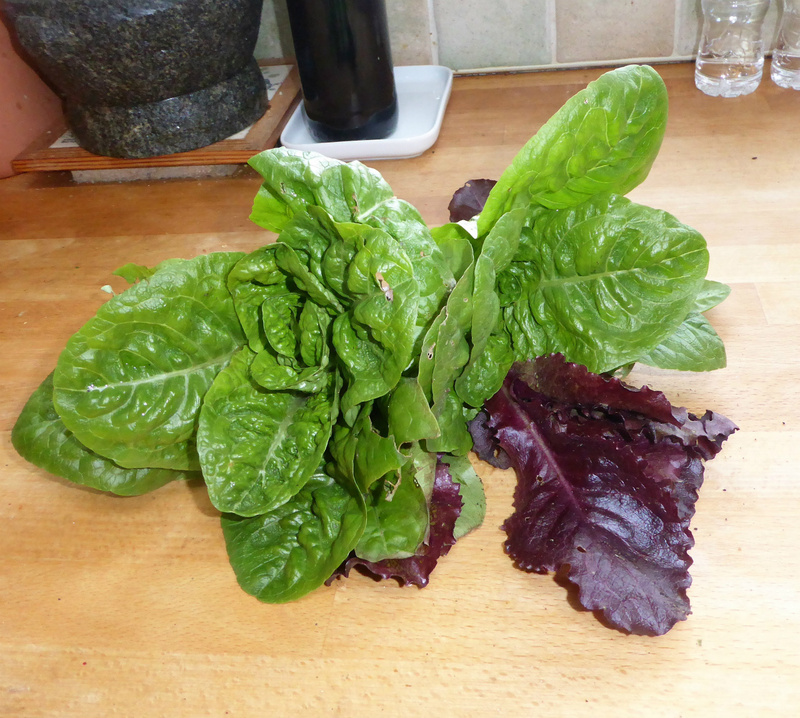 Some of the outside lettuces were a bit frost-bitten, but this little bunch looked good to eat, so home they came for salad with tonight's dinner. They are the remaining few from the supermarket "cut and come again" trays I bought this summer past: excellent value they have been too. Lots of variety in both flavour and texture, and well worth repeating as soon as they are back in the shops again. And that is the end of our harvests today! Delighted to see so little frost damage really. With night time temperatures down to -6°C at night last week and I hoped from afar that I had set the greenhouse heater at a level to protect the plants brought in before we went away. There are precious just-rooted cuttings of pink marguerites, over wintering chilli plants and begonia tubers amongst others. The bubble plastic insulation did its job though and everything looked perfect, much to my relief. Down on the plots the ground was still frozen at mid day in shady areas, which made getting the moolis out of the ground a bit of a challenge, and impossible to take out any parsnips. The carrot bed is still covered with eviromesh, which seems to have afforded enough protection to be able to easily pull out a few roots. The forecast is for a thaw later in the week, so we shall have to whip a few out then and store them, and also try to get the dahlia tubers up that are going to be overwintered at home while we have the chance. 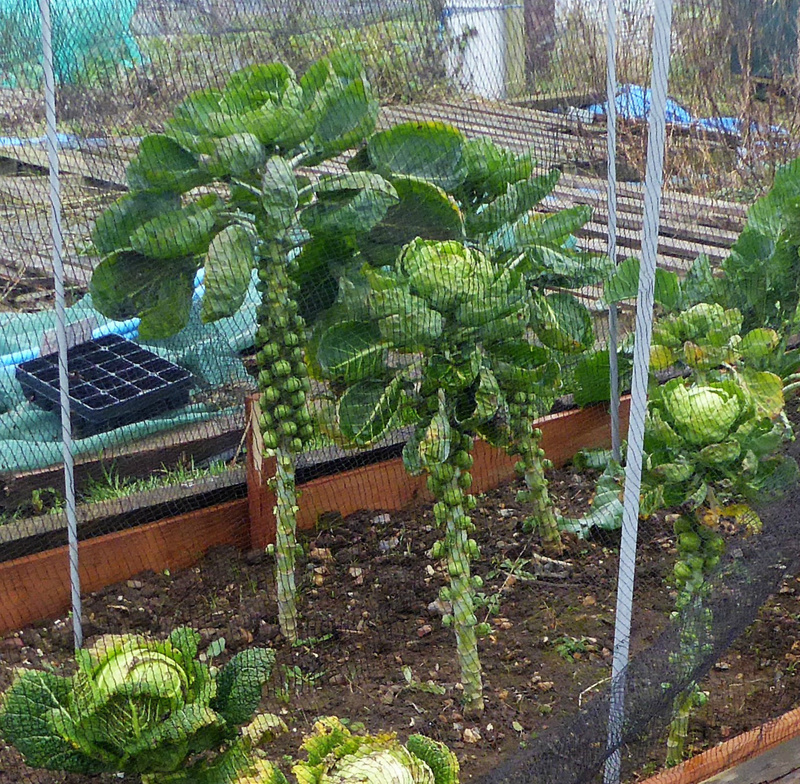 Everything growing in the mini-tunnel came through the cold nights well, and I am looking forward to eating the pak choi and mustard later this week, and hopefully a first picking from the spinach in the cloche too. 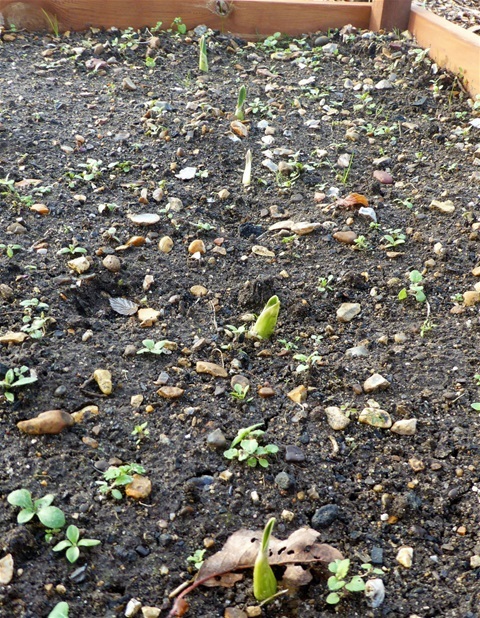 The elephant garlic planted a few weeks back has at last made an appearance. These are the cloves I bought from the Garlic Farm on the Isle of Wight at the beginning of October, and I was beginning to wonder why they had not sprouted... growing roots first, I supect is the answer! 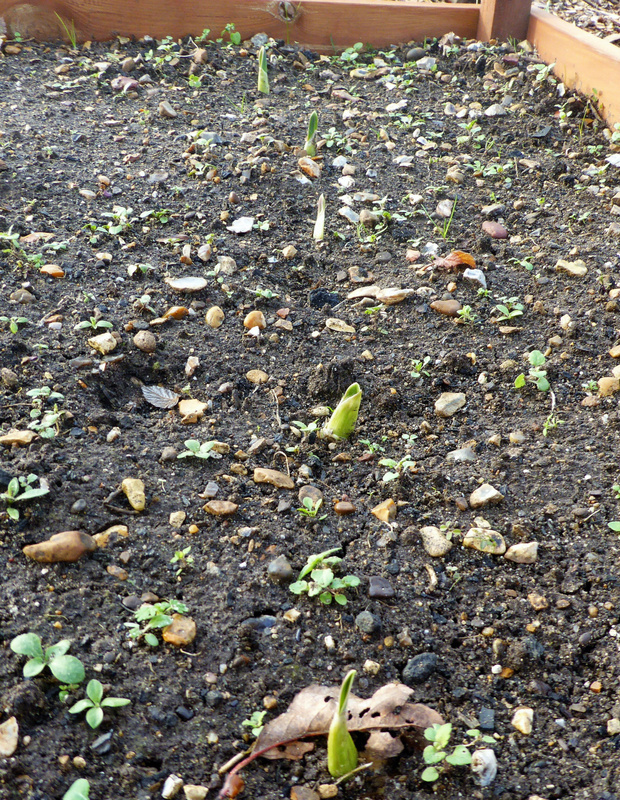 Weeds are of course still growing, as you can see in this photo. Can't pull them out until the ground thaws, but I must try not to let them build up around the onions and garlic this Winter. 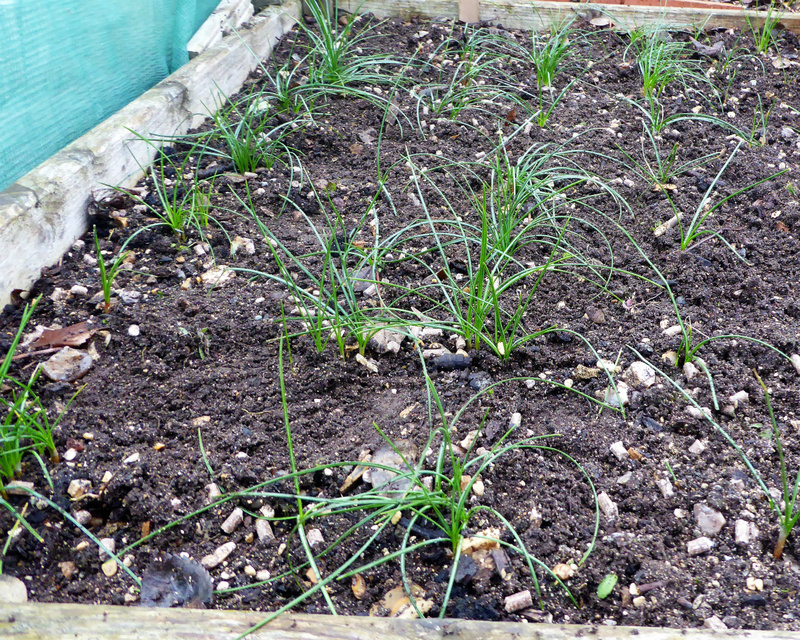 The shallots have strng-looking clusters of leaves growing: these are self saved sets so I am a little relieved they are looking as good as they do. 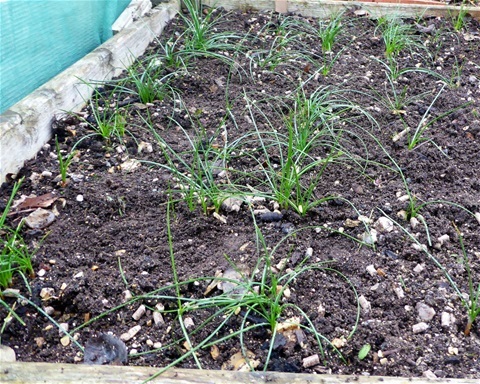 They will certainly benefit from the cold weather as they need this to each start to divide into a clump of new baby shallots. All the various kales and other brassicas are very hardy and so, as you would expect, look just fine. I didn't see a single whitefly on them today, which was good. I know they have not been completely eradicated by a few cold nights, but their number are at least under control for a while. I shall clear up the yellowing leaves that have appeared on the sprout plants, as they may harbour eggs or enable moulds to develop, which should help too. 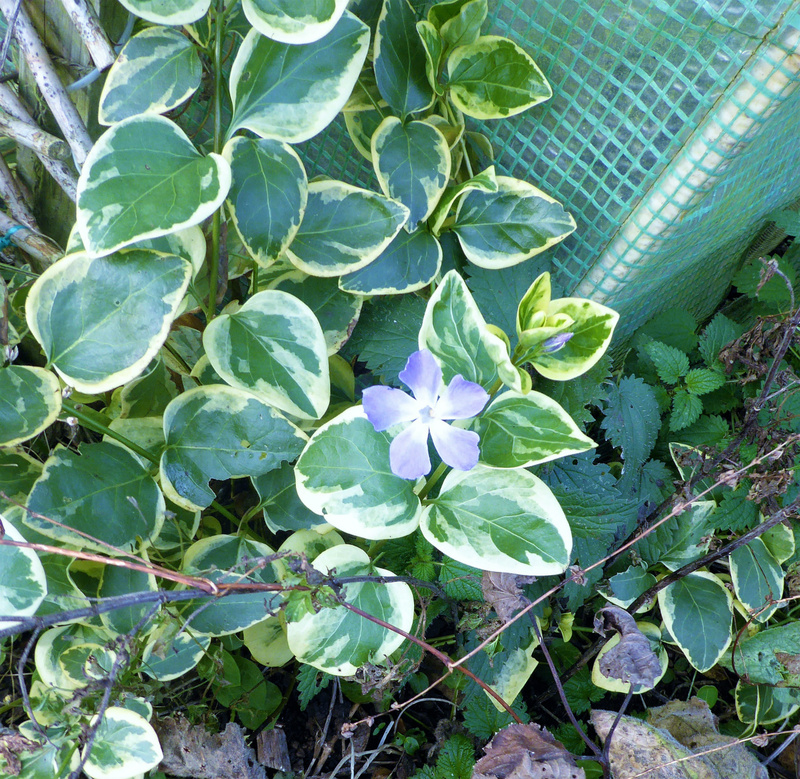 There was one lonely-looking periwinkle flower on #145, sheltered by the mini-tunnel, which may well be the last flower to be seen on the plots this year. 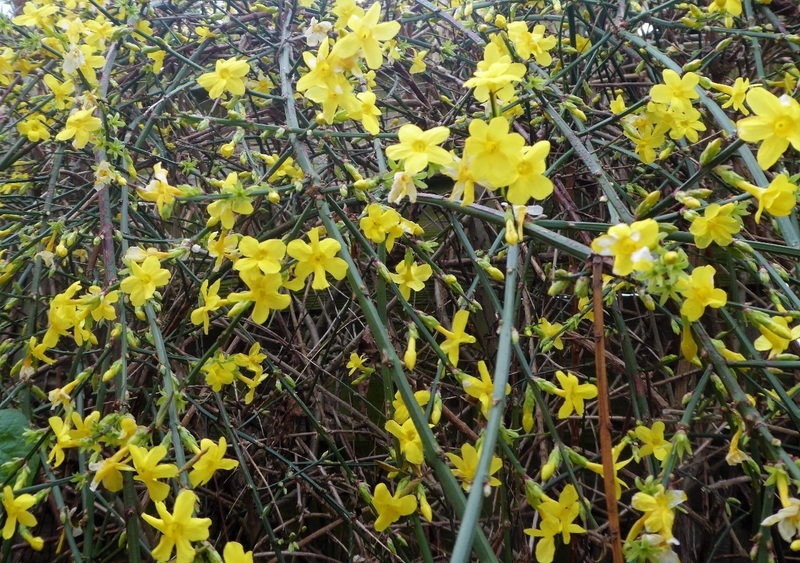 At home, the Winter Flowering Jasmine is putting on a good show of colour by the garage door. It seems to have benefitted from being cut back hard last Spring. And that really is all for this week! Plenty of planning, but need to sort out the seed tins before doing much else, a job I always enjoy. The packets of home-saved seeds need to be slotted in, and any surplus put to the side to share with friends and family whilst still in date.